Todd heading out to eat at an expensive French restaurant with Melissa, but leaving his wallet on the desk in the lounge room at No. 26. HAROLD: Right now, my little Jezebel? MADGE: Delilah, thank you. Jezebel came to a bad end! HAROLD: He he he! So did Delilah! MADGE: At least she brought the house down! MADGE: Harold... where's Reverend Richards? 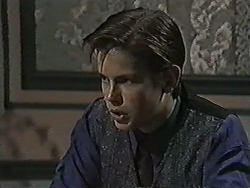 HAROLD: Junior choir. I checked. HENRY: Boy, are *they* in for a surprise! HAROLD: But what if it's important? MADGE: Harold, *we* are important. HAROLD: I'm sure you had a wonderful time... *wonderful* time... and you can tell me all about it in the morning. After breakfast. 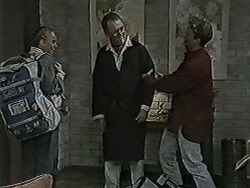 With that, Harold heads quickly to his and Madge's room, leaving Henry and Bronwyn looking bemused! TODD: The coq au vin's nice – that's chicken in red wine – and then there's the Chateaubriand – that's, um, that's steak. The waiter walks off and Todd and Melissa smile at each other. HILARY: I shan't be going to work tomorrow, if that's what you want to know. MATT: You'll feel better in the morning, eh? HILARY: I simply need another day at home. Goodnight. With that, Hilary heads off to her room, leaving Sharon to mutter that she *hates* this. Matt says there's got to be *something* they can do. JOE: Yeah, well, just hold your horses, mate, because the whole thing is a screaming mess. HENRY: Who'd be doing *that*? JOE: That's just the thing, mate: we can't find out; it's very mysterious. Henry stares at him, looking worried. WOMAN: A rose for mademoiselle? TODD: So whereabouts in America do you want to work? MELISSA: Oh, New York – but *everybody* wants to work in New York. As Melissa continues talking, Todd tries surreptitiously feeling around for his wallet, looking worried. TODD: I've left my wallet at home. MELISSA (nervously): Haven't you got any money? TODD: Yeah, sure - $5 in change. MELISSA: I'll have to ‘phone dad. MELISSA: What *else* can we do? TODD: Look, maybe they'll let me go home and get my wallet. TODD (shrugs): It's worth a try. TODD: I seem to have left my wallet at home. TODD (squirming): I've left my wallet at home. Can I please go home and get it? WAITER: I will speak to the maître d', monsieur, to see what can be done. MAÎTRE D': The pill has already been paid, monsieur. MAÎTRE D': A Monsieur Jarrett ‘phoned earlier and he said that it was to be put on his account. That has already been done, Monsieur. Looks of huge relief cross Todd and Melissa's faces and Todd asks Melissa if she wants some more ice-cream! MADGE: Oh yes – *really*! HAROLD: Oh ho ho... at my age, too! HENRY: Yes, I've been hearing all about you! Don't go slipping any of that high-protein diet to the weight-watchers! HAROLD (blankly): What's *that* supposed to mean? HENRY: Oh... something to do with insecticide and weed-killer! HENRY: They love the audition tape and they want to use me on the air! Bronwyn gives him a hug of delight! Henry adds that he has to go and see Ted Morrow, the station manager, for an interview! KERRY: Lassiter's crèche is completely booked out. JOE: Ah, not to worry, love. Business will pick up – you'll see. JOE: Cheaper to stay at home! If only we could get someone to pay you for it, we'd be laughing! KERRY: You're brilliant! You're wonderful! JOE: Go on! Tell me! I need the confidence! KERRY: I'll start my *own* child-caring service, that's what I'll do. KERRY: I'll mind kids *here*. That way I can stay at home, have plenty of time with Sky and earn money. JOE (grins): Another great idea of mine! Kerry goes on that it'll probably be best if they start off with *one* child and see how they go. She then smiles at Joe that they make a good team! MATT: What's the problem, Nick? NICK (curtly): What's the problem? The one right at this very minute? 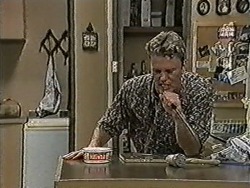 NICK: Well the problem right at this minute is a motormouth. NICK: Correction - *two* motormouths. Sharon asks Nick if they can talk, but Nick just snaps at her to beat it. Sharon looks upset. She walks off. When she's gone, Matt snaps at Nick that that was pathetic; does he get off on putting people down? He then spots Mr. Muir approaching, and he joins him and asks if he can have a word – about Hilary. 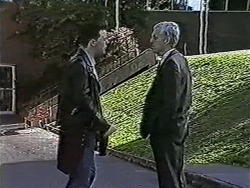 Mr. Muir hesitates, then tells Matt to come to his office. HENRY: Ronald Reagan started on radio! MADGE: Oh Henry. You were supposed to be spending the next six months proving to Gordon Davies that you're responsible enough to be married. MADGE: Love, I don't want to be a wet blanket, *really* I don't, but *someone's* got to say this. HENRY (insists): Mum, it's all going to work out fine. It is. Look, things might be a bit tight for a little while, but the future looks sweet – honest! I am going to be B-I-G big! Once this golden voice hits the airwaves, there'll be no stopping me! BRONWYN: It convinced me that I really do want to be a vet – which means I'm going to have to study extra hard for these exams. SHARON: Nick's dropped me just like ‘that'. I don't even know what I'm supposed to have done. SHARON: I don't know what's going on – he won't tell me. BRONWYN: Is there someone else? SHARON: No. No, I'm sure there's not. He's just changed with *everyone*: he's mean, he's bad-tempered and aggressive. He's treating me like dirt. BRONWYN: Well, if *that's* his attitude, maybe you're better off without him? SHARON: I know you're right, Bronny. It still hurts, though. It really hurts. Sharon breaks down in tears, and Bronwyn puts a comforting arm around her. TODD: Why'd you have to act like such a jerk? Nick ignores him and just retorts that he'll get the tools. MR MUIR: A small token of esteem. I heard you weren't feeling well. MR MUIR: I was very sorry to hear you'd been so distressed. HILARY: I'd rather not talk about it. MR MUIR: No – please. You see, I was rather sorry that it didn't occur to *me* to write such a letter. The sentiments it expressed... they happen to be *my* sentiments. HILARY: Is this because of what I said to you at the Coffee Shop? MR MUIR: You mean am I feeling sorry for you? No. I mean it. I do. A hint of a smile crosses Hilary's face. Joe and Kerry are unpacking Joe's ute, Joe saying as they do so that there's no talking to Henry today: all this DJ bizzo... his brain's on the airwaves already! Kerry points out that he *is* a natural. Joe, however, retorts that that doesn't matter: their business is on the skids, and it doesn't make it any easier with Henry going out and having a love affair with his tonsils! JOE: Where you two jokers off to? NICK: We're doing some gardening for Mr. Franklin. JOE: Hey! You're not the little mongrels stealing my business, are you? NICK (retorts): No, we've got our *own* business. No law against that. JOE: Look, having your own business is one thing, but sneaking behind my back is something different. NICK: If you and Henry hadn't been slacking-off in the first place, none of your customers would've *given* us the business. JOE: You're pinching the bread out of our mouths. 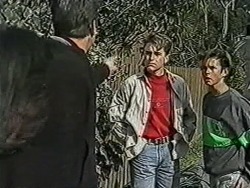 NICK: You come any closer, mate, I'll smash your face in. Joe stops in astonishment. 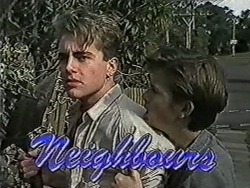 Todd grabs Nick, looking worried.